On sale! 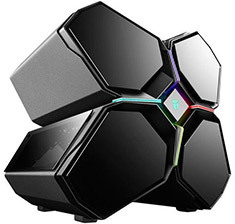 (normally $579) The Deepcool QUADSTELLAR – the world’s first smart PC case has revolutionised conventions by allowing users to customise RGB lighting and heat dissipation systems through an APP. It provides a stylish, high-tech housing for an E-ATX mainboard, multiple graphics cards, power supply and cooling components in four independent compartments to eliminate inter-compartment heat dissipation interference to achieve maximum cooling efficiency.